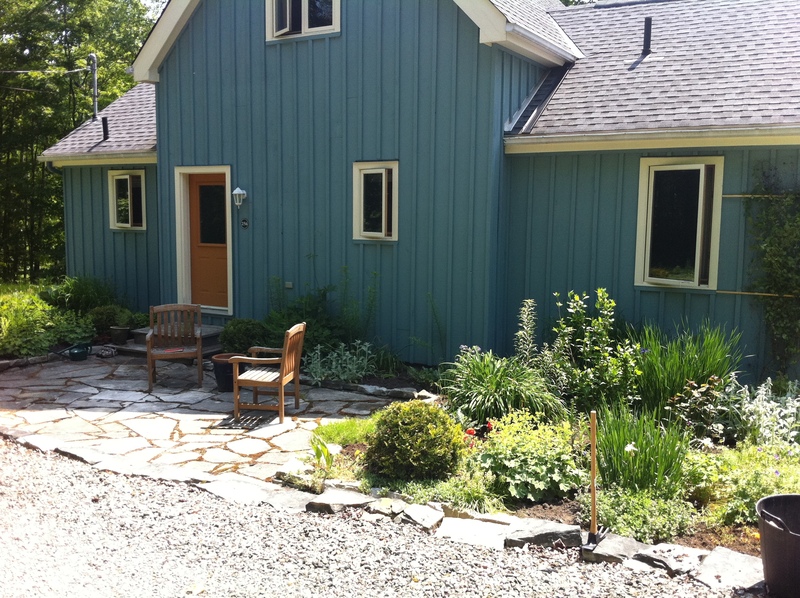 So, in a plot of unadorned Quebec wilderness around a lovely blue house, my very first commissioned garden design was born. 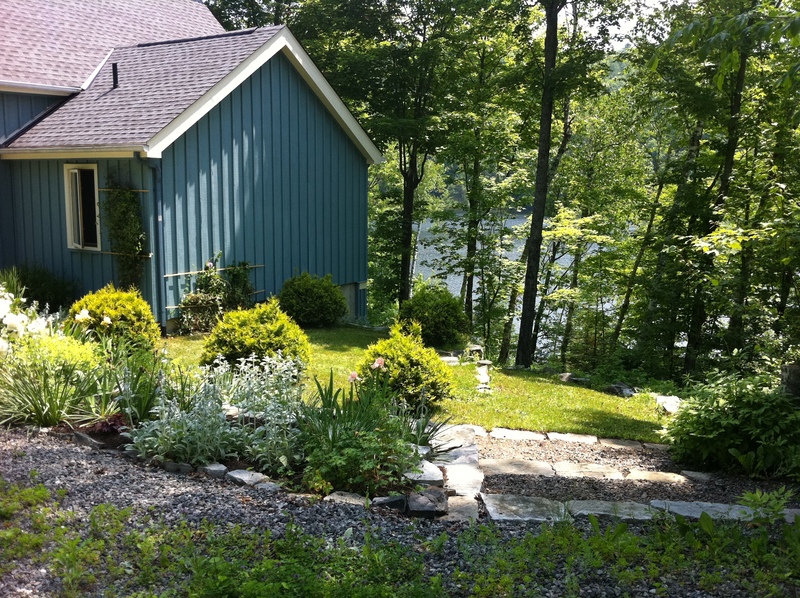 Jeff had this charming home built on a piece of family property that overlooks a picturesque lake. The family cottage is halfway down the hill with its own shallow beach and it had decades of happy summer history for Jeff and his siblings. But now, Jeff wanted a year-round place to call his own on this same piece of heaven and was not at all adverse to the daily commutes into town. The gardens that I originally designed many years ago were in rectangular shaped beds to the left and right of the front door. I used classic garden perennials like creeping phlox, Siberian iris and lambs ears, with a dose of geranium, aster, lady’s mantle and snakeroot thrown in for good measure. Lots of whites and blues, with soft yellows and some dusky pinks were used to satisfy the prescribed palette. And Jeff’s yearning for structure propelled a fixation on golden cedar balls (*wink*) some time later. Unfortunately, a few tries at sentinel evergreens near the front door always seemed to end in disappointment. Never mind. Many years passed and last summer Jeff contacted me again. And with that, he showed me pictures of inspirational gardens done by the heavy hitters. Oh yeah, sure. No pressure. “What happened Jeff? This is a completely different colour palette, not to mention sensibility; it’s much more dynamic and hot. Not pastel at all.” Not only that, he had fallen in love with Tom Stuart Smith‘s gardens, where sublime combinations of grasses, formal evergreens (yay! he could keep some of those golden globe cedars) and perennials with meadow origins are king. That’s the thing about gardens — different plants, different moods are always beckoning. It’s hard to stay loyal to one style. But he still loved structure and views. Do I know Jo? Of course I knew Jo. 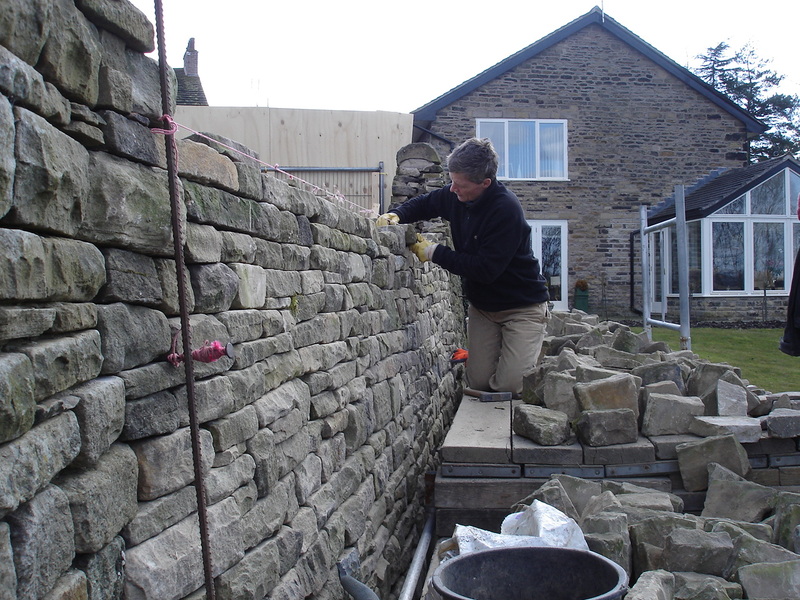 She is only the best dry stone waller around. I think you get the idea. Or perhaps you don’t. Here, let me help you. And if you want to make sure that your stone work is sympathetic to your surroundings, then she’s your girl. It still makes me laugh. We all know that things have to look much worse before they can look better. 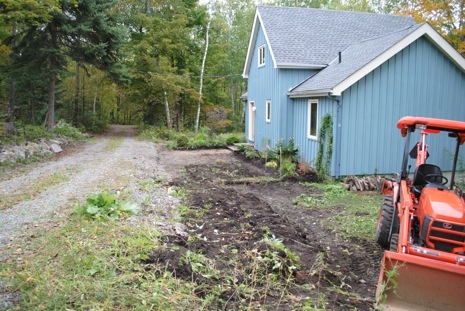 All the existing walls and flagstone were lifted and put aside with the help of Jo’s bright orange Kubota. The plantings next to the front foundation remain, holding their breath till the work is done. 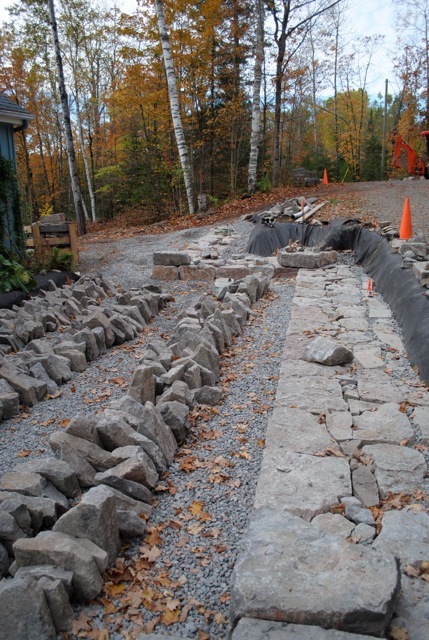 Before any stones are put in place, the sub-base is laid; gravel will act as both support and provide excellent drainage, so that the foundation stones don’t shift. 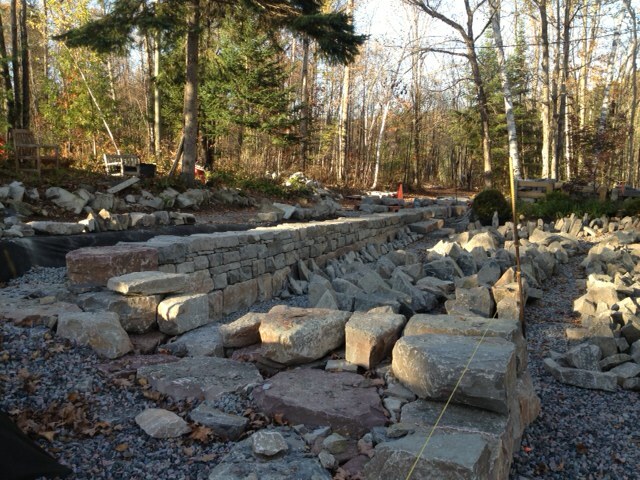 This is the wall that marks and holds the gravel driveway, raised above the house. The wall’s base is wide and solid, ensuring the wall itself will never, ever move. 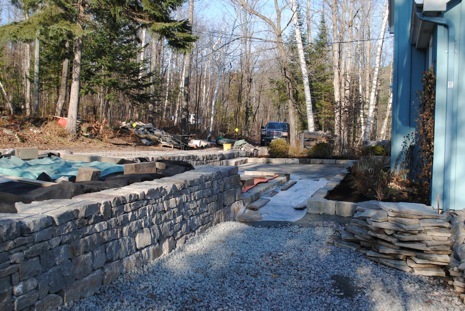 Looking from the opposite direction, now the driveway support wall is all but complete. Jeff says the place looks more like a quarry than his front garden. 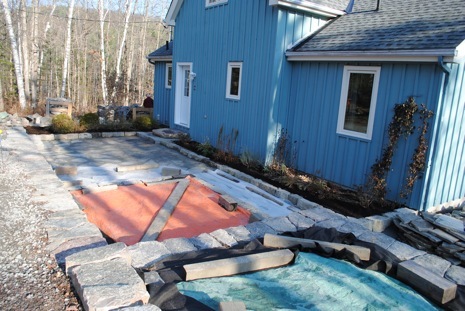 As work continued, the giant curb stones now mark the perimeter of the patio as well as the foundation beds and larger beds. 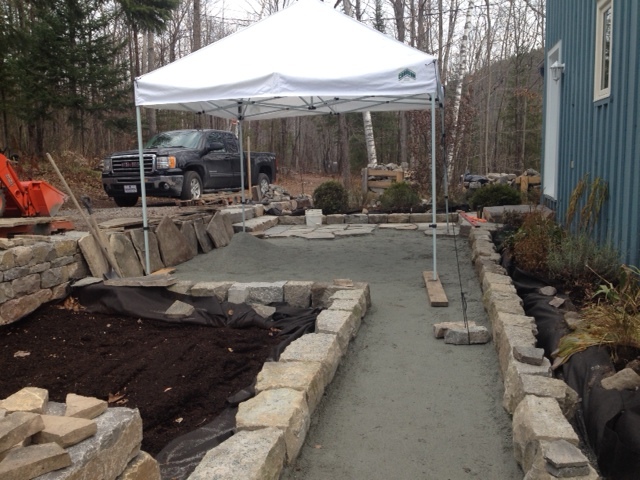 The weather began to turn so in order to keep the rain off the stone dust base for the patio, a tarp was erected. 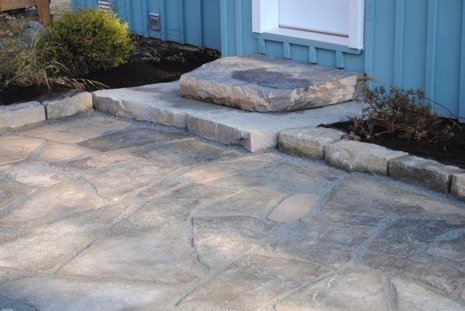 The patio is finally laid and the front door is marked with specially chosen platform stones. It is a far cry from the wonky patio and wooden steps that were there before. Soil is placed in the beds and covered with tarps for now. They await the magic of plants next spring. Work is suspended for the winter and Jo will return next year to resume the project. 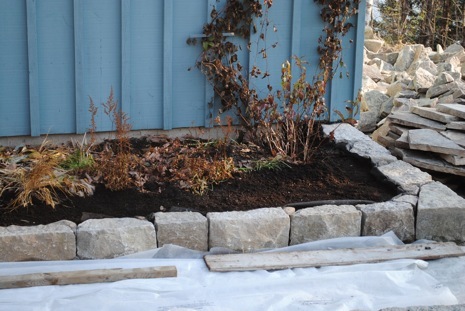 Jeff can barely wait till spring when the virgin beds will be planted; the one closest the viewer at driveway height is bound by that beautiful wall of mortar-free stone and the other is nudged behind it below, on grade with the patio. Do check back and see how it progresses in 2014. 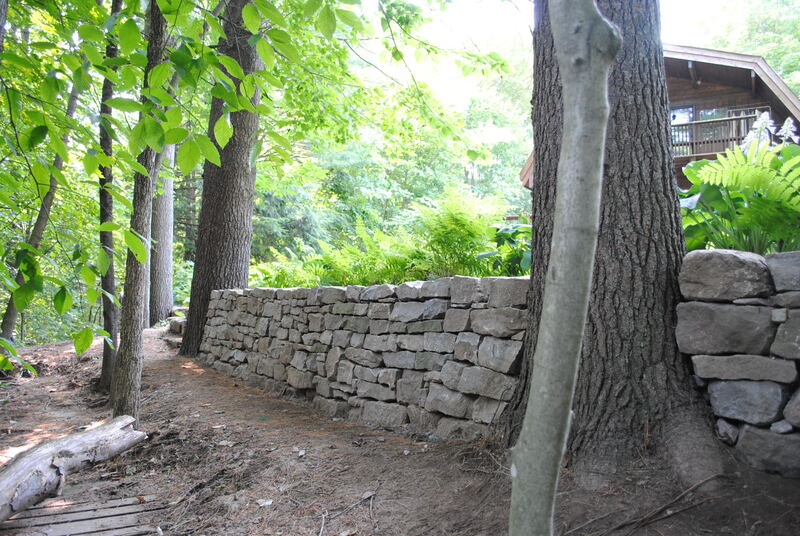 I’m in LOVE with stonewalls. We owned a beach house in So. Dartmouth Ma., and as you might guess from the name, the town was originally settled by British colonists who erected stone walls all over the place. Most of them look as good as they did in the 1600s. 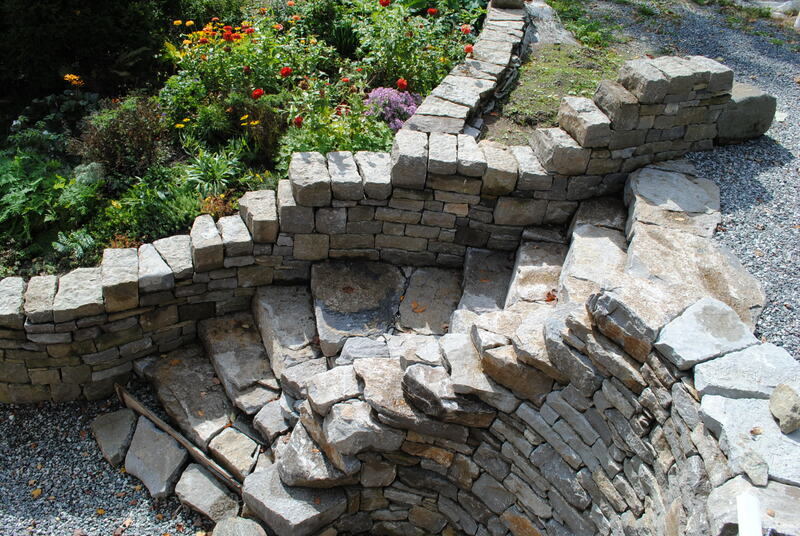 Anyway,.we had a lovely garden behind walls almost identical to what your friend Jeff is having built. I’m impressed!!! Finding craftspeople who can do that today is near impossible! This is a project I’ll be checking in on, for sure!! !